Every exquisite drawing by Santiago Ramón y Cajal, the founder of modern neuroscience, is marred by a curious mark. Here is the little-known story behind it. Generations of neuroscientists have wondered why the elegant and historically important drawings of Santiago Ramón y Cajal, the field’s founder, are marred by a prominent blue stamp. The answer has finally come to light. 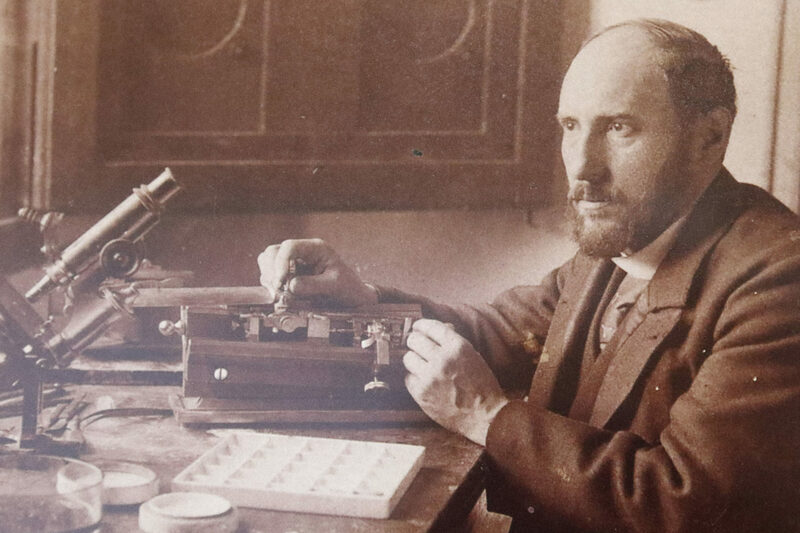 Working alone at the turn of the 20th century in Spain, Santiago Ramón y Cajal (1852-1934) ventured into science as both an artist and a pathologist, and became the first person to see a neuron. Working by gaslight, he made thin slices of brain tissue and subjected them to the same silver-nitrate chemistry he used to capture images on photographic plates. Peering through a microscope at the silver-stained tissue, Cajal saw a thicket of bizarre black shapes resembling swarms of spiny insects embedded in translucent amber. Other scientists examining similar preparations perceived only a bewildering tangle of continuous fibers, which they presumed transmitted nervous energy throughout the brain, like vibrations through a spiderweb. But Cajal observed his slides with an artist’s keen eye for discerning form and function amid chaos, and he saw neurons — individual cells, each one a separate, unique jewel of intricate beauty. Moreover, Cajal saw that the neuron is not a knot in a network that broadcasts signals in every direction: The neuron, he concluded, must pass electrical information in only one direction. Simply from their form, Cajal deduced that nervous signals enter the neuron through its elaborate rootlike dendrites and exit through its single slender axon, and that one neuron relays messages to the next by passing information across a gap of separation, the synapse. Cajal’s two brilliant insights — that every neuron in the brain is separate and that neurons communicate across synapses — came to be known as the neuron doctrine. Because that gap between neurons is too small to see through a light microscope, Camillo Golgi and other rigorous scientists of Cajal’s day at first dismissed the neuron doctrine as a fantasy. It would take another half-century until a new instrument, the electron microscope, could finally confirm what Cajal had seen in his mind’s eye — and carefully sketched out in thousands of stunning pen-and-ink diagrams. But long before the synapse was visible, Cajal’s neuron doctrine had transformed scientists’ understanding of the nervous system and formed the bedrock upon which neuroscience is built. For that reason, Cajal was awarded the 1906 Nobel Prize in physiology or medicine (an honor that, in an ironic twist, he shared with Golgi, who had invented the silver-staining technique that made Cajal’s observations possible). And Cajal’s exquisite, meticulous drawings of neurons in the brain and spinal cord proved to be powerful tools for persuasively communicating his vision to the scientific world. Even today, they continue to inspire neuroscientists. The strange thing is that every one of Cajal’s immortal drawings is marred by an odd bit of deliberate vandalism: a blue cataloging stamp, often placed directly in the middle of the artwork. 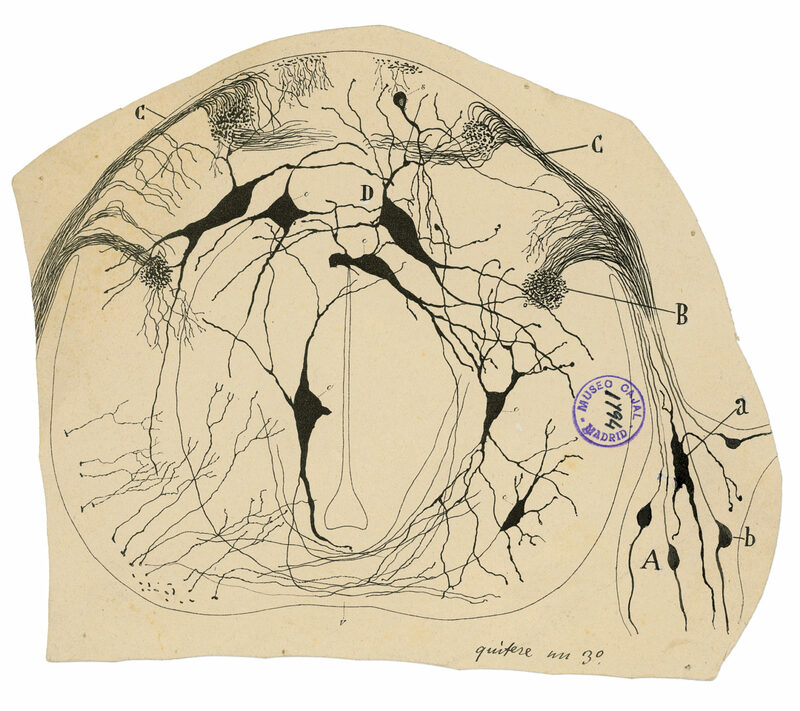 The first time I saw one of his drawings of neurons, when I was a neuroscience graduate student at the University of California, San Diego, I was struck by its beauty and intricacy, but I thought it was a postcard because it was defaced by what looked like an ugly postmark. 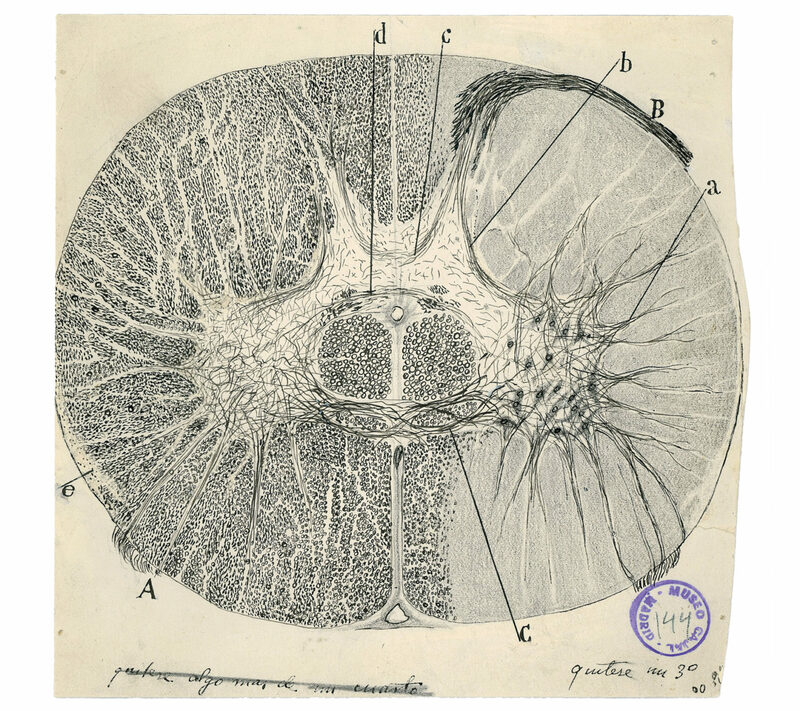 My mentor, the neuroethologist Theodore H. Bullock, assured me that all of Cajal’s drawings had that stamp on them. Why? He didn’t know. In the decades since, when I’ve talked about this with others in neuroscience, no one could solve the mystery. This early photograph of Santiago Ramón y Cajal at his desk (center) is likely a self-portrait. Cajal was an avid photographer who often experimented with black-and-white, color and stereographic images. The flanking images shows some of the tools he used in his work with microscopy. 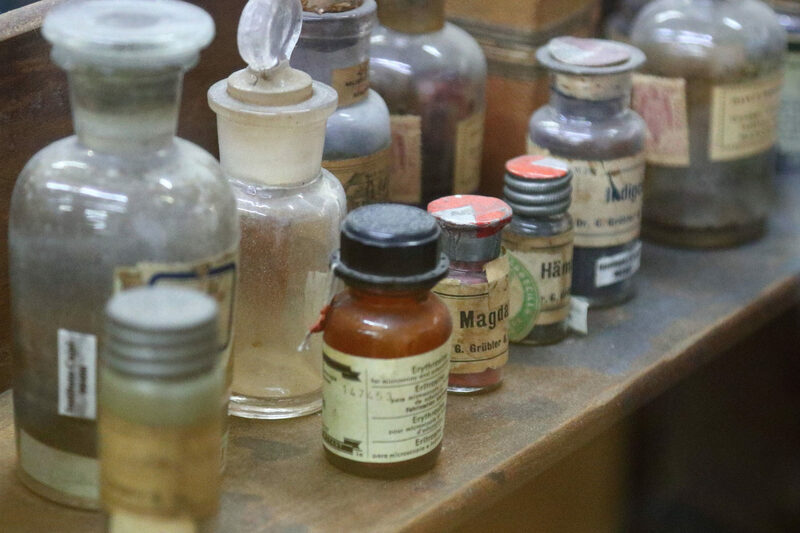 The collection of chemicals with which he stained tissues for microscopy is at left. The Golgi method that Cajal used to stain individual neurons is based on the same silver-nitrate chemistry that he used in developing his photographs. 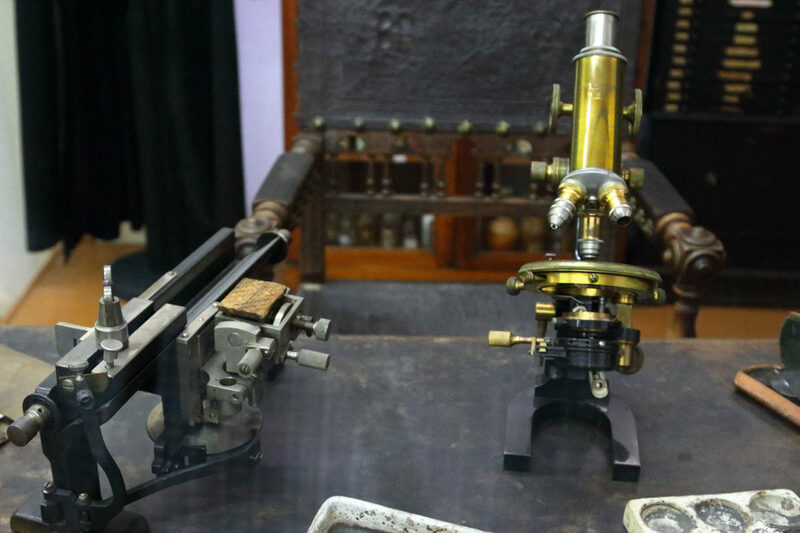 At right are Cajal’s microtome, used for slicing brain tissue to make microscope slides, and his microscope. Last year, I finally learned the truth during a visit to the Cajal Institute in Madrid. Those blue ink stamps were the work of a single man over decades. 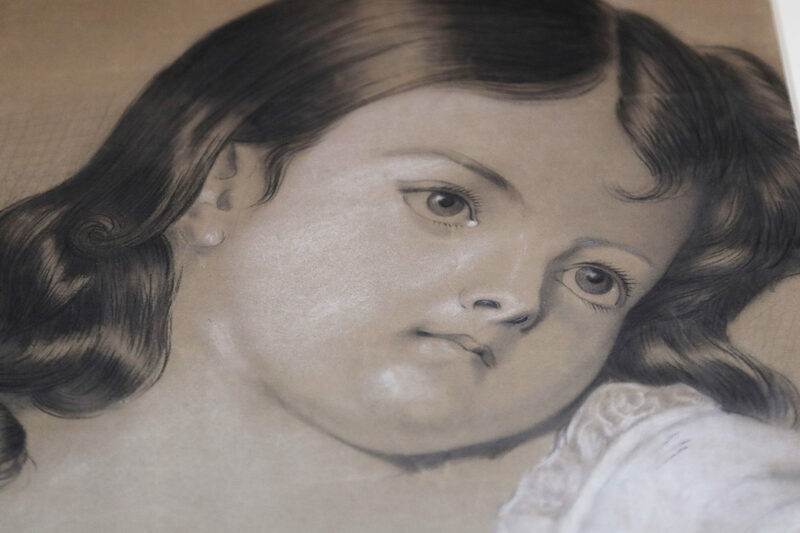 But in a surprising twist, I also discovered that while they may in a sense disfigure the drawings, they also helped to save them. Inside the Cajal Institute, a spiral staircase ascends from the small lobby through three floors of laboratories, each concealed behind a green door with a round porthole, giving visitors the feeling of being on a ship. The ground-floor library contains an exhibit dedicated to Cajal’s drawings and scientific instruments. But during my visit, Ignacio Torres Alemán, a neuroscientist who was the director of the institute at the time, and Ricardo Martinez Murillo, an expert in the blood-brain barrier who was then the vice director, were gracious enough to take me to a room that is not open to the public and is filled with all manner of artifacts from Cajal’s laboratory. The collection includes everything: his microscopes, the microtomes he used to cut brains into thin slices, the boxes of microscope slides he stained by hand to reveal neurons, and his artwork, including drawings and paintings from when he was a child, the oil paintings of cadavers dissected by his physician father that he made as a teenager, and his black-and-white photographs, negatives, stereographs and color photography. These two graceful depictions of neurons in the spinal cord are extraordinary in their detail. Cajal showed neurons as separate, individual cells. He was the first to realize that the nervous system is not a network of continuous fibers, as was widely believed at the time. These two graceful depictions of neurons in the spinal cord are extraordinary in their fine detail. Murillo unlocked the double doors of a fireproof safe containing approximately 3,000 of Cajal’s drawings of neurons from the brain and spinal cord of almost every animal imaginable, including humans. He also brought me a book cataloging the collection, with every item identified by a neatly penned number. 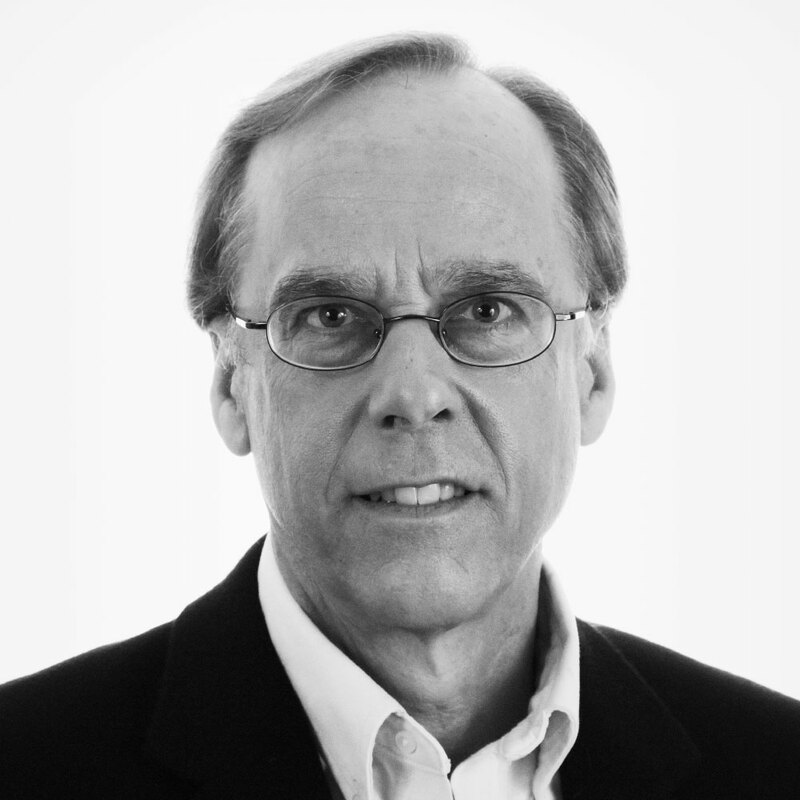 We were soon joined by Adolfo Toledano Gasca, the former secretary of the institute who, as an emeritus professor since 2015, continues to study neurodegenerative disease. From them, I learned that almost all the cataloging and stamping of Cajal’s drawings was the work of one man, Pedro Manzano, who started shortly after the end of the second World War. For his inventory of Cajal’s drawings, notebooks and other belongings, Pedro Manzano kept handwritten ledgers (left) that were periodically authenticated by his supervisors. In addition to Cajal’s scientific works, the collection in Madrid includes his earlier artwork, including this portrait that he sketched as a child. 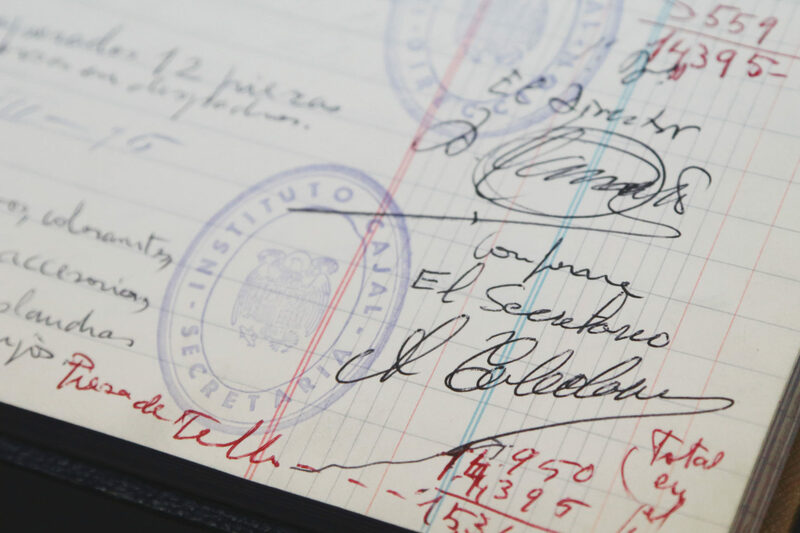 For his inventory of Cajal’s drawings, notebooks and other belongings, Pedro Manzano kept a handwritten ledger (left) that was periodically certified by his supervisors. In addition to Cajal’s scientific works, the collection in Madrid includes his earlier artwork, including this portrait that he sketched as a child. Manzano brought together about 1,200 of Cajal’s drawings during this postwar period, and he stamped each one with a unique number, which he entered in the ledger I had seen. When Toledano arrived at the institute in 1967 as its secretary, he took it upon himself to collect Cajal’s works for posterity more aggressively, even though funds and professional curatorial help were still not available to preserve the priceless works. “All the things of Cajal were dispersed all over the country, in Zaragoza, Barcelona, Valencia and a lot of other places,” Toledano said. He worked with the artist’s youngest son to locate the drawings and instruments scattered about the country. This effort paid off, bringing together the largest share of the artworks and other items in the collection. But they too were stamped by Manzano in his customary way: squarely in the center, with the apparent indifference of a border agent stamping a passport. “Now it is horrible, but at this time in history it was not,” Toledano said. “In the National Library and in the universities at the time, this was normal. The most important thing was that the stamp was placed in the center of the page of the books and the drawings and so on.” He explained that if the stamp had been placed to the side of the artwork or page in Cajal’s laboratory notebook, it could simply be trimmed away by a thief. Similarly, if it had been placed on the back of the work, it would have been hidden from view, offering no disincentive to thieves. “During this period, many people took Cajal’s drawings home,” Toledano said. Manzano died only two years ago. Today, when people see those blue ink stamps he left on every work of Ramón y Cajal, their responses vary. To some, the stamps are an annoying blemish. To others, they are marks of devotion, because without the efforts of Toledano and Manzano, it is likely that most of Cajal’s work would have been lost in Spain’s turbulent history. The blue stamp also hasn’t prevented Cajal’s work from remaining popular in scientific circles. Even in this age of electron microscopy and nuclear magnetic resonance imaging, his drawings retain their power to inspire and inform. While I was at the institute, Toledano opened one of the black boxes of glass microscope slides and held up a histological section of human brain cut and stained by Cajal at the turn of the 20th century. “This one I used in my new paper on senile dementia,” he said with a smile.